Buy Just Natural Organic Millet 500g in the UK from our online shop or directly from our independent Scottish store. This ancient glutenfree grain can be used in place of rice with stews and salads, or ground and used in bread mixes. Millet sausage are a great alternative to meat. Have them between a soft bun or on their own and serve with lots of salad. This recipe contains 250g millet. A healthy porridge made with millet grain, raspberries and dates. Use frozen (mixed) fruit for a year round breakfast. This recipe contains 20 g millet grain. We sell real Just Natural and other Gluten Free Grains directly from our shop in Scotland and online throughout the UK. Where can you buy real Organic Millet safely online? If you are wondering where you can buy Just Natural Organic Millet 500g safely online in the UK, then shop with us. We are an actual health foods shop; with real people selling real foods and products. Our award-winning independent shop is located in Stirling, Scotland since 1976. You can buy our Gluten Free Grains in store or safely place an order with us online or over the phone. 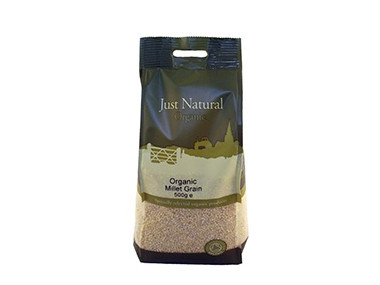 Organic Millet - Just Natural Organic Millet 500g in Gluten Free Grains and Rice, Grains & Oats.